Medicare Part A, B or C? This is available for patients on Medicare (not necessarily Medicare Advantage, see below). It is covered under normal office fee schedules paid through Medicare Part B. Does the patient have to pay a co-pay? Yes. For Medicare Part B, the patient must pay a co-pay of 20% of the service cost out of pocket – also subject to their annual deductible. Are patients on Medicare Advantage eligible? RPM is not yet a standard Medicare benefit and therefore it is not required that private insurance companies offering Medicare Advantage plans (Medicare Part C) follow suit. There may be some plans that do provide coverage, but it is not yet widely adopted. Does a patient need to have two diagnoses? No. There seems to be confusion on this point because chronic care management (CPT 99490, 99487, 99489) does requires two conditions. There is no such requirement for Remote Patient Monitoring (CPT 99454 / 99457). There is no defined list of conditions and it is up to the billing practitioner to determine what is medically necessary and reasonable. CHF, COPD, hypertension, and diabetes are some of the most commonly addressed conditions. However, remote patient monitoring is an excellent enhancement to the care plan of a patient, post-surgery. There are other use cases where RPM is a good enhancement to the care plan of a patient with comorbid conditions, such as behavioral health. For more on that topic, see below. What licensure requirement is needed for the 20-minute patient review of CPT 99457? What level of supervision is required? On March 14, 2019, however, CMS released a technical correction stating that the services for CPT 99457 could be billed “incident to” the billing practitioner’s professional services. However, the default for Medicare is direct supervision which means that the physician and auxiliary personnel must be in the same building at the same time. Consequently (and unlike CCM), these services cannot be managed by an outside clinical team, unless physically located under the same roof. There is no specific licensure requirements and CMS has stated that the review must be administered by “clinical staff/physician/other qualified healthcare professional.” A medical assistant (MA), for example, would suffice in most cases. How long can a patient be on an RPM program? There is no defined limit. It is up to the billing practitioner to determine what is necessary and medically reasonable. For patients who have incurable chronic conditions, they can stay on program indefinitely – even if stable and their condition is manageable. Can the RPM codes be billed with other services such as Chronic Care Management (CCM), Transitional Care Management (TCM), and Behavioral Health Integration (BHI)? Yes. All may be billed simultaneously, provided that the requirements for each are met independently. For example, a patient can be in a CCM program and an RPM program at the same time, and both may be billed. The data available from each complements the other, but the staff providing the review must provide at least forty (40) minutes of review per month – twenty (20) minutes allocated to each service respectively. The time cannot be counted twice, meaning the same twenty (20) minutes cannot be utilized for each service. Why do I need a telehealth hub / RPM hub? Why can’t I buy off-the-shelf medical devices and have my patients use their smartphone? You could. But I do not recommend this unless you will be employing a full-time technical support staff member to maintain the various equipment services. You also need to ensure the data is aggregated and presented in a way that is meaningful to your staff. Consumer applications are not scalable and it can be difficult to track outcomes or managing program adherence may not be efficiently done, using off-the-shelf equipment. In addition, MobileHelp covers the cellular transport costs as part of our standard business model. Other than patient co-pays, there are no out-of-pocket costs to the patient and no hidden fees to you or your organization. 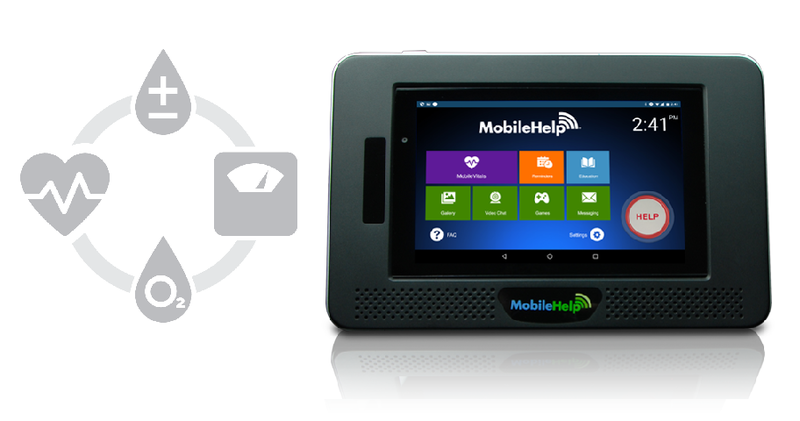 An additional advantage of the hub is that many (including the MobileHelp equipment) incorporate video visit capability and enable other face-to-face services that can be delivered via telehealth. Many RPM systems have “alerts” for patient data. Do I need this? What happens if an alert happens after hours? There is no requirement to be alerted on patient vitals, and you can disable this feature if desired. That is a medical/operational decision to be made by you and your practice. You may find it helpful, however, to use the alerts. When a large number of patients are on the program, the alerts help prioritize those patients that need contact first. Therefore, the patients who need to be seen in the clinic are of higher acuity while those who benefit from virtual care, remain at home. With the MobileVitals® platform, the alerts are queued and arranged chronologically so that your staff can always identify alerts from the previous evening or before hours of operation. We recommend that the patient consent forms notify the patient that RPM is not a substitute for calling the emergency services (“9-1-1”) in an emergency. We are happy to provide sample consent forms for your practice upon request. Ultimately, it will be up to you and your staff to determine the policies governing your patient review response times. Should RPM be viewed as an operational investment in positive outcomes? Does the reimbursement cover the costs to the practice? Both. CPT 99454 covers the cost of the equipment and data transmission. And CPT 99457 covers the time of your staff providing the patient review. Because it is possible to use medical assistants or other clinical staff besides the physician time, the reimbursement should be appropriate for both cases. However, most practices will see a benefit to patients with chronic conditions. Being able to keep them engaged in their health – as well as gaining visibility into health data between office visits will be invaluable. And, the use of such digital technologies may help to detect early indicators of treatment that need to be addressed or altered. Additionally, clinicians participating in the Merit -Based Incentive System (MIPS) can benefit from the use of RPM to provide outcomes and avoid unnecessary cost. In addition, having an RPM/telehealth hub in a patient hub now enables other telehealth services that you and your patients may find useful. There are a number of face-to-face codes that can be delivered by telehealth. Once the RPM hub is in the home, covered by 99454, it makes it that much easier to interact with patients using other reimbursable services. This additional feature is especially helpful for patients who have difficulty traveling for regular in-office visits. No. At MobileHelp Healthcare we have developed quick-start materials and pilot-programs designed to minimize your investment and shorten your deployment cycle. We provide the template forms, staff training, and education. The training is easy and usually can be accomplished in ninety (90) minutes through a short web meeting. Is there a contract required to get started? There is no minimum monthly commitment, but there is a contract required. This is to protect both parties and clearly identify responsibilities. In addition, for HIPAA data privacy reasons, this also contractually obligates our company to meet your privacy requirements by law. Please sign up for an initial MobileHelp RPM program discussion by completing the form here.